package which fits together to meet the requirements of most any raceway application. Installed at school systems, hospitals, research centers, factories, offices, and many other end-user locations, HT Series raceway systems make the difference in aesthetics, durability and cost savings through designs which promote easy installation. HT Series low voltage raceway (TSR) is a one piece, non-metallic, adhesive backed latching raceway designed to aesthetically organize and route communications wires including high speed UTP cable and fiber optic cable from the telecommunications room to the work area. A complete line of fittings to manage connectivity requirements from the telecommunications room to the work area. Each size of raceway offers numerous fittings, offered in electrical ivory, white or office white, including TIA/EIA-568-B compliant 1" bend radius accessories which help ensure consistent data transmission performance of Category 5, 5e and 6 communications systems. HT Series TSRP power surface raceway is a one piece, non-metallic, adhesive backed latching raceway designed to aesthetically organize and route either power or communications cables. 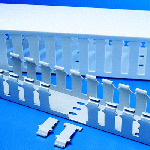 HT Series InfoStream is a revolutionary design for a non-metallic raceway system. The elliptical shape is aesthetically pleasing when compared to other designs. By using the three rails to snap in dividers, the InfoStream system can accommodate up to four separate channels of electrical, voice, data, video or fiber optic cabling. InfoStream’s unique and patented design make installations quicker and easier. The raceway and fittings are manufactured from a UL 94V-0 rated material. Standard slotted wall Pro-Duct features break-away fingers which provide additional access for wire leads. Each section of the duct is provided with two score lines. The upper score line is used to break away fingers when a greater opening is required. The lower score line allows the sidewall to be smoothly cut for joints and "T's". 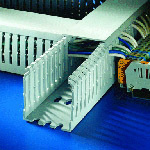 Certain sizes of slotted wall wiring duct are available in intrinsic blue color. This indicates that the control panel is intrinsically safe - often required in applications where explosive gases exist. 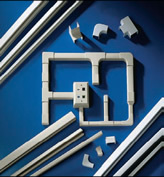 Contact Clark Wire & Cable for details and specific sizes of intrinsic blue, slotted wall wiring duct. High-density slotted wall Pro-Duct comes with narrow fingers, equaling a 2 to 1 finger ratio compared to standard slotted wiring duct. The narrow fingers reduce fanning of the wires to the terminal blocks for a neater appearance and to accommodate more compact designs and components in control panels, communications closets, and other applications.